Msg 102, Level 15, State 1, Line 1 Incorrect syntax near ‘FROMTABLE’. However, some typos doesn’t create an syntax error. Instead it alters the meaning of the t-sql statement in an perhaps unwanted way. Check out the following example. Wait a minute! Something is wrong here… Is Ben really 140 years old? Did you spot the “error” in the select statement? Maybe you did, but with more columns and with less obvious data it gets a lot harder. What the result shows is actually CUST_NAME and WEIGHT_KG. Not AGE, altough it says so. But WEIGHT has the header AGE. AGE isn’t even returned by the query. By now I guess you have spotted the missing comma after WEIGHT_KG, causing this behaviour. 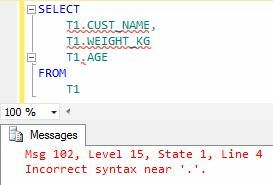 SQL Server interprets the statement as “WEIGHT as AGE”, that is, with an column alias name. The “as” keyword is optional however, making this particular typing error easy to make. This can lead to some really nasty bugs in your database. Imagine the accidental missing comma in the statement “PaidAmount UnPaidAmount” for instance. “All” that happens is that a column changes its name to another columns name, and that you’ll have one column less in the result set. Msg 102, Level 15, State 1, Line 4 Incorrect syntax near ‘.’. This is becasue dots (.) are not allowed in alias names.